Full frame Mirrorless cameras...are they going to dominate ? Who will buy? Just out of interest, what are people's thoughts on how this affects third party lens manufacturers - there are still millions of (D)SLRs out there needing lenses, and no doubt new models will continue to be released - but all the attention is on mirrorless, and if it can maintain this momentum, I can seethe switch-over being much more rapid than anticipated, just as the switch to digital was - but if it stalls, for whatever reason, third party could find themselves over-investing in a new mount. The cautionary approach would be to just go on with the lenses they've been making and let people use adaptors, but that could leave them looking behind the curve. The reason I'm wondering is that there's still no release date on the the Tokina Opera 50/1.4 - are they having difficulties or second thoughts? I doubt it. The majority of ILC photographers still use SLRs. The majority of new sales are still SLRs and that is considering that many people aren't updating them nearly as often as they used to. If Tokina releases a new lens in EOS or F mount, it will sell far more copies than if they release it in Z mount or EOS-R.
For that matter, it isn't particularly hard for them to port it over to those other mounts if they want to and if copies aren't selling, they can take them off store shelves and replace the mounts relatively cheaply. For it to stall there has to be real valid foreseeable reasons that prevents it from going forward. Mainly technical. At this moment it doesnt seem like so. EVFs are becoming apparently more sharper because pixel density. At the this moment I think the advantages and disadvantages are even. Then again we have people who are still bent on shooting film. So DSLR will still be around for a long time. Who will take the lead, we are yet to find out in 10 years. "The switch over". There is not an inevitable switch over. "Momentum" in sales is imaginary. It's a mental thing, not a physical thing like the moving of a ball moving down a hill." It can turn on a dime at any time. The thing now is a certain percentage of the population is switching, but not all. The assumption that it will ever be all is untestable. Last edited by normhead; 09-18-2018 at 10:24 AM. The reason I'm wondering is that there's still no release date on the the Tokina Opera 50/1.4 - are they having difficulties or second thoughts? More than likely Tokina will reveal it next week,thats only a guess, but there IS a camera show on somewhere! Who will take the lead, we are yet to find out in 10 years. The Big player,Canon,has publicly stated the R mount is like what they did when they introduced EF....They are emphasising this is the direction they are heading.Their R&D,advertising,Brand strength will accelerate M/L...i'll expect parity by the end of 2020.After that who knows? In saying that,Dslr wont disappear quickly or at all.There will always people who use them. The biggest threat to Dslr/Mirrorless is the AI that will come into smartphone cameras.Many of the modern sensors are developed and implemented there first.Certainly phones wont completely wipe photographic devices out either in the short term,But 20-50 years from now??? Tech waits for nobody and sweeps all before it! there IS a camera show on somewhere! I'm wondering how it will go adapting onto the $$$ony bodies? Aren't the E-mount specs publicly available? In that case, I would expect to see E-mount lenses when it is convenient to design and produce them. Z-mount and R-mount are strictly proprietary, so producing a lens for them requires reverse-engineering .... and even then you can't be sure of a hidden "gotcha". I would expect to see E-mount lenses when it is convenient to design and produce them. Tokina announced CaNik mounts only.I'd think its wait and see howthe sales of those go B4 the smaller section of the market is addressed. Have adapters to the Dslr mounts so it can be used. One of the big advantages of mirrorless is the same as RF cameras. The lens mount/sensor distance can be much shorter. That has a big impact on lens design especially at the wide end. Not just ultra wides but even moderate ones. The clearance the mirror needs puts large constraints on the lens designer. Not only getting the angle of view but also keeping the distortion down. It can also make it easier to make the lenses faster as there is more room for a larger rear element. Then again, because of that reduction in distance, it is not "just" a case of changing the lens mount ring and contacts to adapt existing designs to the shorter distance of mirrorless. So although the third party makers may decide to use the same basic optical design but they will have to use a new body. Up to now, the mirrorless market has been concentrated has been concentrated at the shorter end of spectrum. Maybe the main reason the SLR has had the advantage at the long end is the sports/action/wildlife market. Until recently many EVFs were considered too slow. That is now changing and once the lag/flare problems are sorted such consideration will become less important. That has a big impact on lens design especially at the wide end. Not just ultra wides but even moderate ones. The clearance the mirror needs puts large constraints on the lens designer. That has never turned out to be even remotely true. When Pentax with their apron. 40mm registration distance make a 4-mm lens, it's tiny. When a camera with a shorter registration distance makes a 20mm lens it can be tiny. Both have to add weight to make the lenses shorter than registration distances or longer. And as soon as you go over the shorter registration distance, the lenses get heavier. That's why there has never been a lot of measurable difference, and short registration telephotos are beasts. You really have to think these things through. Not just repeat marekting hype. The question should never be "What did they imply.was possible." And the answer should always be to the question "what did they deliver?" Anyone with a 40XS knows, there's nothing smaller on a shorter registration camera of the same format. The whole goal of marketing is to say the most misleading thing you can think of in favour of your product, without outright lying, although sometimes outright lying happens too. Last edited by normhead; 09-18-2018 at 03:34 PM. Primes with a focal length of close to the registration distance are the smallest lenses for a given mount. If you have a shorter registration distance, as Norm says, you can make smaller lenses in the 20 to 25mm range. On the other hand, for a mount like the K mount, you can have really small lenses that are a bit longer like the DA 40, DA 70, FA 43, and FA 77. There are a couple of things more to mention. One of the ways that that mirrorless companies shrink their lenses is by under engineering them and using in camera adjustments to fix aberrations, vignetting, etc. Lenses that are well corrected and have fast apertures, like some of the Zeiss lenses and the new DFA *50 are going to be big lenses, regardless of the registration distance. The final thing is that fast zooms are big regardless of the lens mount. I don't think there is much difference in size between 24-70 f2.8 lenses of similar performance regardless of mirrorless or SLR construction. It is true many rely on correction. However that was not available in film days. In "comparison" look at many of the RF lenses not only in M mount but also thread mount. Many of the Leica lenses were considered to be among the highest optical performing and yet are tiny in comparison to todays lenses. Not just Leica but Canon, Zeiss etc. Even the modern incarnations. 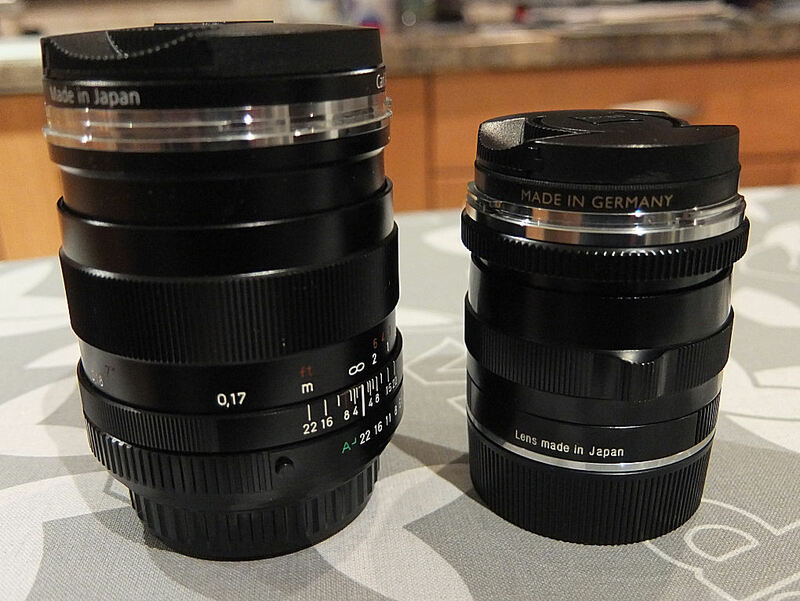 A "comparison" of the Zeiss 25/2.8 Biogon, The ZK version and the M version. The oblique angle of the light rays coming from the small lens' back elements make that general rule only true for film cameras. Film does a decent job of capturing light coming at oblique angles. But even on film, such compact wide-angle lenses tend to have vignetting. For digital sensors, oblique angle rays tend to bounce off the shiny surfaces of sensor and it's glass filters or fail to be captured by the microlenses in front of the pixels. The result is pretty sever vignetting. The glass filters also create some field curvature in where the light from the lens focuses. It has always been a compromise. In film days, slight vignetting was easy to correct at the printing stage. On the other hand, correcting distortions was much more difficult. Retrofocus or reversed telephoto lenses tend to suffer barrel distortion. However even at 35mm, a retrofocus design was often needed to give enough space for the mirror. The ZK 28.2.5 lens in my pic above is a Distagon design and is retrofocus. The Leica mount one is a Biogon design and more of a short focus design. Though not shown in the pic, the rear element protrudes some distance from the mount and that sits much closer to the film plane than an SLR. For "Digital" the laws of physics and the way light behaves does not change. A distortion free lens will be distortion free regardless of the sensor. However, the degree of vignetting depends on aperture and so this would have to be allowed for in post processing. Any barrel distortion is more easy to predict and program for either in or out of the camera and so accepting the limitations of a retrofocus design might be preferable. I do believe in the end, the thing which governs the design and construction is primarily the price target rather than the optical properties. So, yes some makers, especially third party ones will under engineer their lenses to keep the price "competitive".